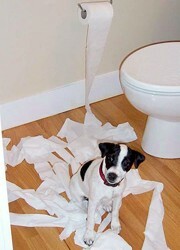 Is your dog unspooling the toilet paper from its roll on a regular basis? 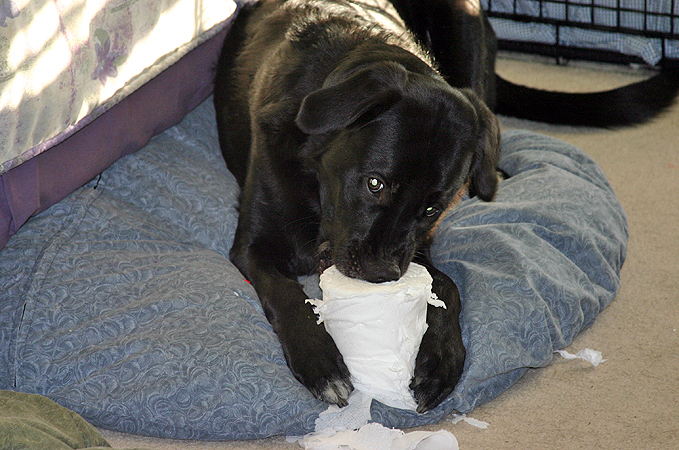 Recently, my dog Destin (who is part Black Lab, part Golden Retriever) started unrolling the toilet paper in one of our bathrooms. I’m not sure what started this behavior (he’s 3 years old), but as cute as it is, I was determined to find a way to stop it. Fortunately, I discovered a quick trick that will most likely stop your four-legged friend from playing with the toilet paper roll in the future too! It’s simple!… Just turn the roll around so that it pulls from BEHIND rather than in front. 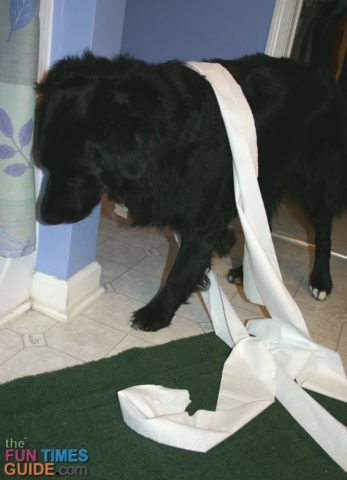 From my experience, switching up the toilet paper direction appears to make it less fun for mischievous dogs (and cats) to play with. It kind of makes sense… because it takes more effort for your pet to freely dispense the toilet paper this way. But when the paper rolls FORWARD, all it takes is a couple of swipes with the paw to create a glorious pile of white softly-scented fluff. …I don’t know, but it worked for us! Destin hasn’t done it since. 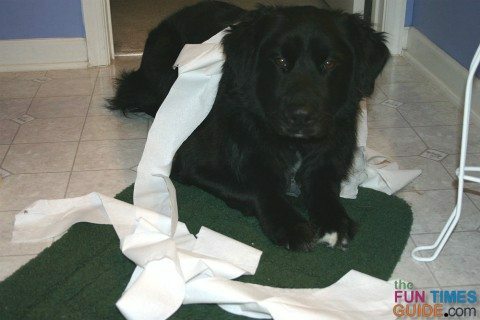 If your dog enjoys grabbing the toilet paper and dragging it around the house (toilet paper unrolling), you can either leave the bathroom door closed or set up a nasty surprise to teach him to keep his paws off. Oh, and don’t leave a roll of toilet paper on the edge of the counter or something either.